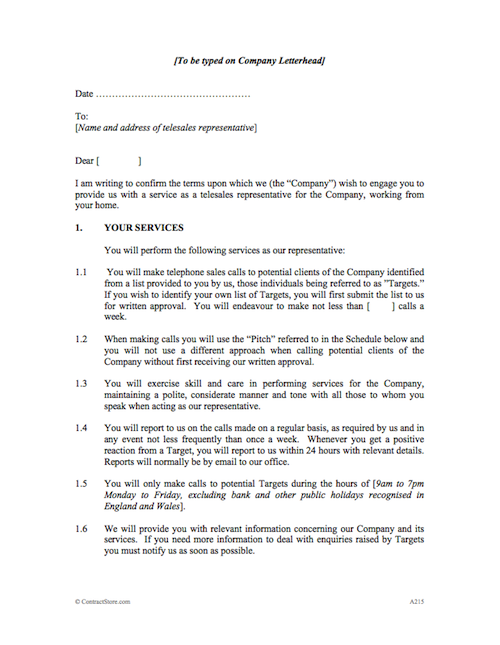 What is this Telemarketing Contract Template for? It is a telephone sales agreement in letter form setting out the terms upon which a company is to retain the services of a telesales representative acting as an independent contractor. You need this document if you are an organisation looking to hire an independent telesales agent. 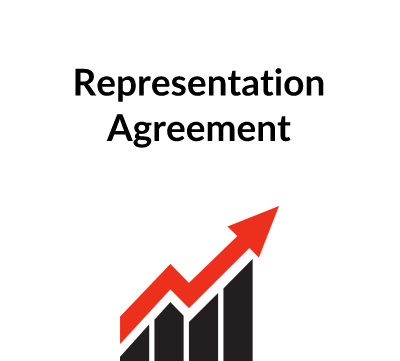 It sets out the terms on which the telesales representative is appointed and covers the representative’s duties, standards of service and commission arrangements: the representative gets paid according to the value of introductions. The representative is a freelancer, not an employee. Duties of representative. These include calling a list of target numbers, standard of service and reporting. Commission and payment. The agreement will specify the calculation of commission by reference to successful introductions and the terms of payment. Status of representative: this is a freelance post and the representative is not an employee, so they are responsible for their own tax and national insurance contributions etc. Confidentiality and good faith. These are important considerations. Duration and termination. These need to be clearly specified. ContractStore supplies templates and is not a law firm. But all our templates are written by experienced lawyers so we can arrange legal assistance for customers who need special terms in one of our documents or a bespoke template. . For more information see our Legal Services page. This short letter based agreement appointing a telesales representative is drafted from the company’s interest. It is appropriate only for use where the telesales representative is self-employed, i.e. an ‘independent contractor’. Please note that it is not suitable for the sale of products the sales of which are regulated by the Financial Services Authority (“FSA”) e.g. savings plans, mortgages, investments or any form of insurance including ‘payment protection’. 1.1. This states that call shall be made from a list of targets supplied by the company and that additional proposed targets must be approved beforehand. The last sentence is worded in such a way as to avoid a binding obligation to make a set number of calls per week so as to reduce the risk that the telesales worker might subsequently claim that he/she lacked sufficient control over his/her working day to qualify as an independent contractor and was, instead, an employee of the company. These clauses oblige the telesales representative to follow the company’s ‘pitch’ when making calls, to make calls only within specified hours and to report on calls made, positive responses received and any complaints. 1.6 This obliges the company to provide all necessary information for the calls to be made whilst requiring the telesales representative to ask the company for any additional material as may be necessary. 1.7 This prohibits the telesales worker from selling other goods and services to targets. 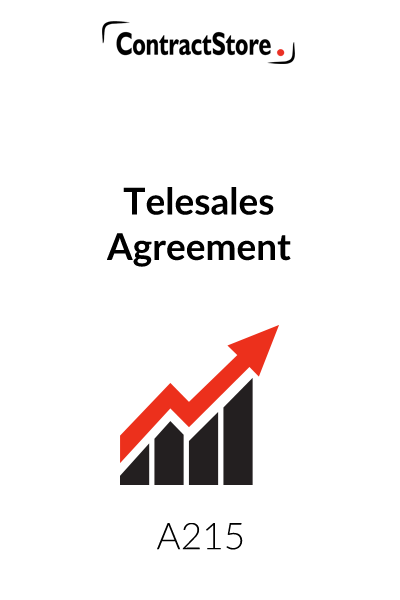 Any restrictions on the right of a telesales worker to sell different goods and services to non-targets might be unenforceable but it is not unreasonable to prevent the telesales worker from representing any competitor of the company while this agreement is in place. The optional wording (in italics) might be included to prevent the individual form working for a competitor for a period after the agreement comes to an end. This set out the entitlement of the telesales worker to a percentage based sales commission on customers introduced to the company. There are two alternatives for calculating commission, one of which should be deleted. Alternative A applies when the company is supplying a service to the customer over a period of time. Alternative B applies to sales of goods or one-off sales of products. In either case if any refund has to be made, the company can recover any commission that ha been paid. Each month the company provides the telesales representative with a statement showing sales made through him/her and the commission due. The telesales representative must then invoice the company on the basis of the company’s statement. The date for payment of invoices is 14 days but you may want a longer period. The agreement commences as from the date of the letter, is of unfixed duration and may be terminated by either party on 30 days written notice. The possibility of commission being paid after termination in some circumstances is contemplated here. This is a standard provision for the protection of the company’s confidential information, including its target lists. Note that the obligation of confidentiality continues indefinitely after termination. The second paragraph sets out two exceptions: disclosure made because of legal/regulatory obligations and disclosure to third party professional advisers such as lawyers. A standard provision obliging the telesales representative to deal in an honest manner with the company. Crucially this defines the relationship between the parties: the telesales representative is an independent contractor or self-employed representative of the company as opposed to an employee. Further there is no principal-agency relationship thus the telesales representative has no authority to legally bind the company and the company will not be liable for the acts of its representative. To ensure that third parties (such as targets) do not assume that the representative is either an employee or agent care should be taken in the drafting of the ‘pitch’ so as to make the relationship between the parties clear to all. The second paragraph reminds the telesales representative that it is his/her responsibility alone to ensure that there are no legal restrictions on home-working (terms in leases, mortgage deeds, insurance policies, local bye-laws/planning restrictions) and that the manner in which he/she works complies with the Health and Safety at Work Act 1974. Following on from paragraph 6 it is made clear that the telesales representative is self-employed for tax and NI purposes and that if HMR&C challenge that status the telesales representative will be liable for any liabilities or costs faced by the company. In practice, unless a company can be shown to have colluded with a purported independent contractor to try and hide what was in reality a contract of employment, there is little risk that a company will face penalties in the event that self-employed status is questioned. To ensure that the company can be confident that obligations under this contract are carried out by the telesales representative he/she is prohibited from assigning or delegating his/her obligations to a third party. In addition to the right of both parties to terminate on 30 days written notice at paragraph 3 there is an additional right for the company to terminate should the telesales representative become unable to fulfil his/her obligations, become insolvent or be in breach of the terms of the agreement. This makes clear that the telesales representative is liable to the company in respect of all losses/costs that it may incur as a result of the telesales representative’s negligence or breach of the agreement. It is very broadly worded and in practice it is unlikely that a court would order recovery of ‘indirect’ losses (such as damage to reputation) or losses specific to the particular nature of the company where the telesales representative would not have known of that. A standard provision dealing with the manner in which formal notices (e.g. notice of termination) are served. The governing law of the agreement is English law and where direct negotiation and formal mediation fail to resolve a dispute between the parties the English courts have jurisdiction to make orders as appropriate. Finally the penultimate paragraph makes it clear that the legal relationship between the parties is governed only by the agreement. This is important to avoid the risk of confusion.